Shiba Inus, Dogs, and Humans. In that order. Well, Tierce is much better on the Cyclosporine, although I’m not a fan of giving him a pill that requires an anti-nausea pill to keep it in him. 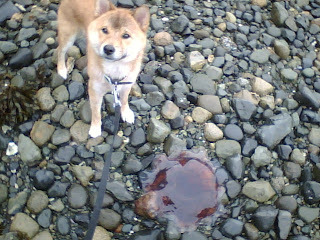 Here he is next to one of many jellyfish that washed up on the shore beside Departure Bay Terminal (BC Ferries). Shassi (forgot to get a picture tonight) is… a 15 year old dog. My aunt took her to one of the best vets in Nanaimo and got a complete blood panel done. Verdict: Shassi is in good shape for a 15 year old dog, but her kidneys are failing. Not entirely an unforeseen thing. Fortunately, my aunt is determined to take care of her and is feeding her the lowest-protein dog food that she can find. Katana, the subject of my last post is, according to Petfinder, still looking for a home. Bella, the Shiba missing since this April, is still at large. Wow, lots of good news, huh? Well, I’m just glad that Tierce isn’t scratching as much and he can stop wearing the cone most of the time! Previous Article← Katana needs a home! How in the world could i have forgotten about Bella?!?!?!?! Praying for her.. Praying that the asian gods will hear me. YAY? Shassi.. has your aunt commited to her.. YAY! small wins.. lets all do the Yay dance! Victorinox has come out with a stellar knife for 2018 - the Chinese Year of the Dog. So where have you been? © 2019 The Misanthropic Shiba. All rights reserved.